It doesn’t look creepy from the street, nestled in the hills near the Greek Theatre, with a view of Frank Lloyd Wright’s iconic Ennis House from its backyard, but there is a place here in Los Angeles steeped in madness, murder, and obsession. 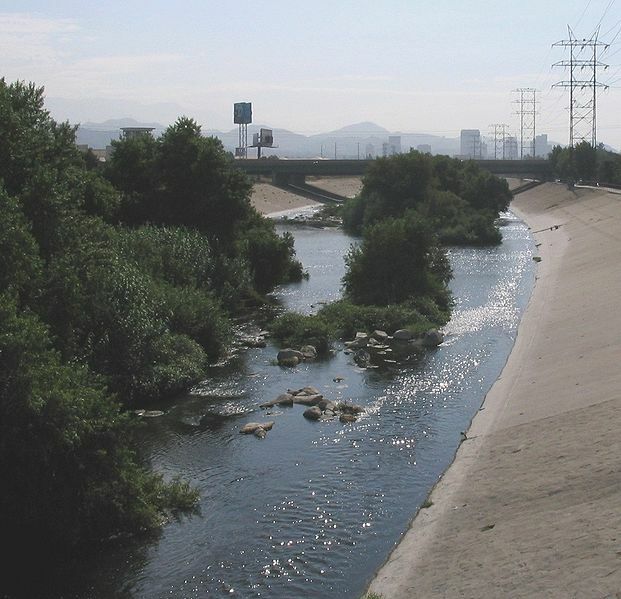 In truth, there are many places like that in L.A., but this one is especially eerie not just for what happened there but for the long, weird aftermath of what happened: a perfect petri dish for urban legends, ghostly tales, and obsessive-compulsive behavior. 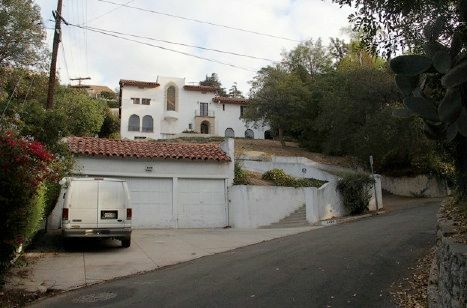 It’s known as the Los Feliz Murder Mansion and it’s gotten more than its share of byplay on the internet. Hardly a blogger of uncanny stuff in Los Angeles has been able to resist its siren call. Oh, and the Ennis House? You may remember that from the original Vincent Price version of House on Haunted Hill. It was used for the exterior shots. The movie was released the very same year that the Los Feliz Murder Mansion became infamous. I suspect most people’s obsession with the place began with this article from 2009 by Bob Pool, writing for the Los Angeles Times. That’s certainly when mine began. In a nutshell: in the early hours of December 6, 1959, Dr. Harold Perelson, a heart surgeon, bludgeoned his wife to death in her sleep with a balpeen hammer, then tried to do the same to his eighteen-year-old daughter, Judye. His daughter fought him off, screaming, and woke up the two younger children in the house who came running to find out what was going on. Dr. Perelman told them they were having a nightmare and to go back to sleep. They went back to their rooms, but the interlude allowed Judye to escape down the long, winding driveway of the mansion to a neighbor. By the time the police arrived, Dr. Perelson had drunk either poison or acid (reports vary) and killed himself. The two younger children were safe in their rooms. A horrible tragedy, but one that would probably have faded with time because, unfortunately, this is a scenario that has been encountered in the news many times. But here’s where the obsession kicks in. You see, the house was bought at a probate sale in 1960 by a couple named Emily and Julian Enriquez. It’s said (though I no longer remember where I read this) that the family moved in with their son, Rudy, for a very brief time, and moved back out again suddenly, leaving all the Perelson furniture and possessions behind—and, it’s said, some of their own. Since then, for more than fifty years, the mansion has sat abandoned. The Enriquez family used it over the years to store things, but to this day you can peak into its windows and see covered mid-century modern furniture, 1950s-era newspapers and magazines, Christmas presents, board games, an ancient TV, and other bric-a-brac of life back then. In 1994, Rudy Enriquez inherited the mansion from his mother. He has continued their non-use of the place, steadfastly refusing all offers to buy it. The house itself is now so derelict it’s probably a tear-down, but the real estate it sits upon is some of the priciest and most desirable in Los Angeles. Estimates of its value range up to 2.9 million. But he continues to let it rot, unless forced by the city or the neighbors to do something about the upkeep of the property—at least on the outside. The inside remains a freakish time capsule of murder and abandonment. Of course, stories abound of the place being haunted and having a weird feel. Even the Times article couldn’t resist a spooky bit at the end, telling the story of a neighbor whose curiosity got the better of her. She briefly pushed open the mansion’s backdoor to snoop, but heard the burglar alarm and beat a hasty retreat. Her hand started to throb and a ugly red vein traveled up her arm. A visit to the ER confirmed that her brief foray into Breaking and Entering had left her with the bite of a black widow spider. Two nights later, the burglar alarm on her own backdoor kept going off, but when she looked, no one was there. “It was like the ghost was following us,” she said. Rudy Enriquez himself claims, “The only spooky thing there is me. Tell people to say their prayers every morning and evening and they’ll be OK.” Which, I have to say, does nothing to alleviate the spookiness. Since the publication of the Times article, looky loos have driven the neighbors crazy trespassing on the property and breaking into the mansion. Those same neighbors originally encouraged the article because prostitutes and other unsavory types had started breaking in to crash. That doesn’t happen anymore since the owner put in an alarm system, but the unexpected consequences of the neighborhood stirring up the public’s curiosity and obsession is clearly a case of be careful what you wish for. If you want to know the depth of obsession out there, visit the Find-a-Death thread on it. But I warn you, if you visit that site and read through the entire thread, be prepared to spend hours. I also fell into the rabbit hole of obsession about this place right after I read the Times article. When I saw that Dr. Harold Perelson had a medical practice in Inglewood, near to my own home, something deep and strange clicked inside me. My backbrain insisted this information had personal significance, that I needed to find out where the practice had been located. I immediately jumped to the conclusion that the doctor had once had an office in the old Inglewood medical building where my mother’s kidney specialist practiced. The building certainly seemed like it could date back to 1959. Who knew? Maybe his practice had been in the same office the nephrologists now occupied! I became obsessed with finding out. I scoured the internet for online collections of street maps and phone books. There were many, but nothing online for Inglewood of that time period. I knew I would have to physically go to one of the libraries containing these holdings and look up the information, but my life was so frantic by then with being a full time caregiver and working full time that, well, time was the one thing I didn’t have. I couldn’t even take an afternoon off to go to a library. I’d let it go for a while, but the obsession still gripped me. Every now and then, I’d revisit the online archives to see if the phone books, et al., had been uploaded, and I’d search out more articles and information on the case, finding the most obscure things to download to my mystery folder. I’d visit Find-a-Death, too, to see what they’d come up with. Then I stopped being a caregiver through the inevitable way those things happen. 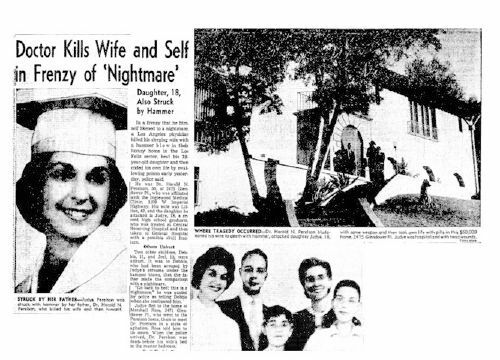 I didn’t immediately think of the Los Feliz Murder Mansion, but a month later while clearing out old files from my computer, I came across the folder where I kept my mystery stories. Los Feliz, being the most obsessional of them all, jumped out at me. Out of idle (okay, not so idle) curiosity I decided to head back to Google. My old “friends” at Find-a-Death (I’m not a member, although I have taken Scott Michaels’ tour) popped up so I visited the site. I went to the most recent page to work my way backward for the “newest” posts about this old mystery. People still post about it, the mansion is still abandoned, still owned by Rudy Enriquez, still a burden to its neighbors, still spooky as hell. Several pages back from the last entry, a post from November 2014 gave the address of Dr. Perelson’s medical practice. The poster believed it was now a family dental clinic. I was thrilled and disappointed at the same time. It wasn’t the address for the building in which my mother’s doctors practiced. What the heck could my backbrain have been thinking? Clearly, not for the first time, I’d fallen prey to flights of morbid imagination. But the address—3108 W. Imperial Highway—did have something of a personal connection, after all. You see, I’d driven along portions of Imperial Highway 3-4 (or more) times a week for the last five years. My mother’s dialysis clinic was on Imperial Highway. I didn’t think I was emotionally ready to make that drive again, so I looked up the address on Google street view. The building housing the family dental clinic was gone. That area has seen a vast revival, and a new mall exists where the office once stood. That’s why Google maps showed the address in the middle of an intersection. It doesn’t exist anymore. But I knew that intersection, knew it well. I sat staring at it in shock a long, long time. Because, you see, I’d driven through it 3-4 (or more) times a week for the last five years. It was located approximately a half block from my mother’s dialysis center. Click here to see pictures of that intersection. Is my obsession gone? Once I’d made the personal connection it did fade. But old obsessions are hard to kill and I feel it grabbling for my attention even now. I think sometimes we prefer our mysteries unsolved so we can reside forever in the sweet tantalization of speculation. Certainly, I believe the scores of people doggedly pursuing this story will be disappointed once Rudy dies and the mansion invariably gets sold off and torn down. But you never know. Maybe new mysteries will spring from its footprints. Ghosts are as hard to get rid of as obsessions and not always banished by the rational expediency of tear-down. For what are ghosts if not the stubborn obsessions of human souls unready and unbelieving in death, unable to give up their unfinished business, playing and replaying their moments of personal nightmare? It doesn’t look creepy from the street, nestled in the hills near the Greek Theatre, with a view of Frank Lloyd Wright’s iconic Ennis House from its backyard, but there is a place here in Los Angeles steeped in madness, murder, and obsession. 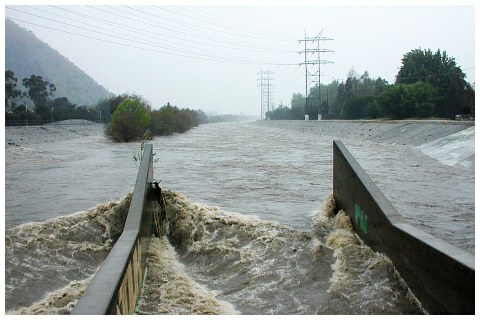 In truth, there are many places like that in L.A., but this one is especially eerie not just for what happened there but for the long, weird aftermath of what happened. It’s known as the Los Feliz Murder Mansion and it’s gotten a certain amount of obsessive byplay on the internet. Hardly a blogger of uncanny stuff in Los Angeles has been able to resist its siren call. Oh, and the Ennis House? You may remember that from the original Vincent Price version of House on Haunted Hill. It was used for the exterior shots. The movie was released in the very same year that the Los Feliz Murder Mansion became infamous. from 2009 by Bob Pool, writing for the Los Angeles Times. That’s certainly when mine began. In a nutshell: in the early morning hours of December 6, 1959, Dr. Harold Perelson, a heart surgeon, bludgeoned his wife to death in her sleep with a balpeen hammer, then tried to do the same to his eighteen-year-old daughter, Judye. His daughter fought him off, screaming, and waking up the two younger children in the house who came running to find out what was going on. Dr. Perelman told them they were having a nightmare and to go back to sleep. They went back to their rooms, but the interlude allowed Judye to escape down the long, winding driveway of the mansion to a neighbor. By the time the police arrived, Dr. Perelson had drunk either poison or acid (reports vary) and killed himself. The two younger children were safe in their rooms. A horrible tragedy, but one that would probably have faded with time because, unfortunately, this is a scenario that has been encountered in the news many times. But here’s where the obsession part kicks in. You see, the house was bought at a probate sale in 1960 by a couple named Emily and Julian Enriquez. It’s said (though I no longer remember where I read this) that the family moved in with their son, Rudy, for a very brief time, and moved back out again suddenly, leaving all the Perelson furniture and possessions behind—and, it’s said, some of their own. Since then, for more than fifty years, the mansion has sat abandoned. The Enriquez family used it over the years to store things, but to this day you can peak into its windows and see covered mid-century modern furniture, 1950s-era newspapers and magazines, board games, an ancient TV, and other bric-a-brac of life back then. In 1994, Rudy Enriquez inherited the mansion from his mother. He has continued their non-use of the place, steadfastly refusing all offers to buy the mansion. The house itself is now so derelict it’s probably a tear-down, but the real estate it sits upon is some of the priciest and most desirable in Los Angeles. He could make a fortune selling it. Estimates range up to 2.9 million. But he continues to let it rot, unless forced by the city or the neighbors to do something about the upkeep of the property—at least on the outside. The inside remains a freakish time capsule of murder and abandonment. Of course, stories abound of the place being haunted and having a weird feel. Even the Times article couldn’t resist a spooky bit at the end. Rudy Enriquez himself claims, “The only spooky thing there is me. Tell people to say their prayers every morning and evening and they’ll be OK.” Which, I have to say, does nothing to alleviate the spookiness. Driving west on Manchester from Crenshaw, I noticed the neon sign for the Love Divine Chapel looked a little worse for wear: dirty, chipped, lacking in light. Neon signs always look a little depressed when they aren’t turned on, but I imagine that even when the giant L-O-V-E shone in the night it would still look dingy. The tiny meeting hall beside the sign needed paint and repair, the revival bus parked in the miniscule lot needed new tires. The homeless man holding up the hand-scrawled cardboard “Need Food” sign didn’t seem to notice the irony of standing beneath dingy love. Further down Manchester, the planes coming into LAX paralleled the avenue, low and seeming-slow, though I knew they were speeding over the depressed neighborhoods below. Customers lined up twenty deep at Randy’s Donuts. Even if you’re not from L.A. or have never been here, you’ve probably seen Randy’s Donuts in some montage or other: it’s the gigantic donut sitting on top of the tiny building right off the freeway. A sort of emblem of L.A. in it’s way. The space shuttle parked outside it for awhile, resting on its cross-town journey from LAX to the Museum of Science and Industry. Randy’s is a kind of demarcation point between the poorer neighborhoods and the gradual swing to upscale as you head west. As the blocks whiz by the prices of rent and purchase gradually rise towards affluent Westchester. My parents bought in when Westchester was still a down at the heels lower middle class neighborhood, but it got “discovered” in the nineties and it’s fully gentrified now. Anything west of Sepulveda Boulevard is pretty pricy. As I got closer to Sepulveda I saw a giant billboard advertising a place where they freeze fat for cosmetic reasons. I don’t even want to think about that too much. “Fear No Mirror” the billboard declared in far larger letters than the LOVE of the Divine Chapel. I realized we’d moved from the land of Fear No Evil to the land of Vanity of Vanities. I fear no mirrors, comfortable in my aging skin, even as another birthday approaches. I do fear the fear of mirrors, however. There is peace in accepting the passage of time, the transformation of the flesh, but we don’t live in an age—and I don’t live in a city—that accepts such peace. Rather the hard lessons of perpetually hard bodies, ever in denial, ever running too fast to stop and listen to the soft words of the soul. What evils have been wrought in the name of vanity, and continue to be wrought. Yea, verily. This isn’t as grand a mystery as some I have blogged about, but it is a personal one. My stepdad, Tom, the former Marine, used to work as a house painter. One day he came home from a job in one of the ritzier neighborhoods—Hollywood Hills? Beverly Hills? Brentwood? Bel Air? I can’t remember anymore, as this was many years ago now (the early 90s). Anyway, the people who lived in the house where he was working as a sub-contractor were chucking out a bunch of stuff to remodel. He came home with an enormous cabinet loaded on his truck. This cabinet was about four or five feet wide, about six or seven feet long, and divided in the middle, but it only stood about three or four feet high. It had a lovely blond wood finish. 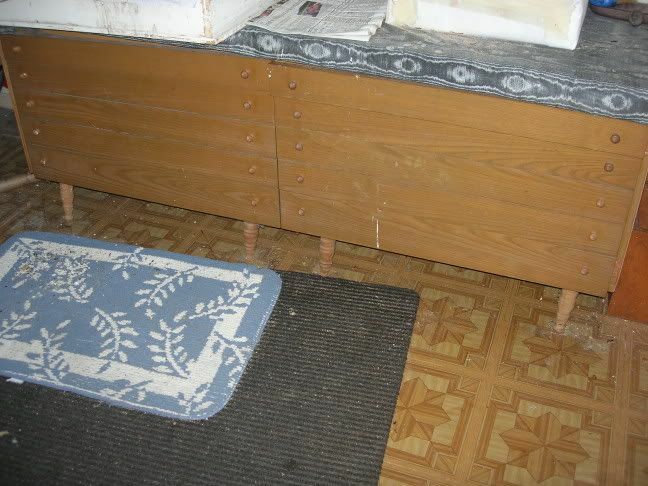 The drawers were deep but very shallow, making it resemble one of those for holding maps. It was totally cool and I totally loved it. Of course I wanted it. So he and a buddy unloaded it from the truck. (It weighed a ton and a half, btw.) As they tilted it to get it through the door, I noticed someone had written across the unfinished bottom, “Kubrick”—like a maker’s mark to help identify who the thing was meant for. Disappointing, but still cool, and still a really great cabinet. I did indeed fill it up with arts and crafts supplies. Sadly, I couldn’t take it with me when I moved from the family manse and my mother felt much less reverence for it than I. To her it was a gigantic, unwieldy piece of furniture that always got in the way. She tried numerous times to get me to allow her to give it away, but I wouldn’t, so she had someone move it out to the patio, put the bird cage on it, and there is has remained, sadly abused. Stanley Kubrick’s brother, Ma! She failed to see the significance, but I told a number of people about it. Some years later I decided to search the IMdb for this Leonard Kubrick. No such guy. In fact, further research also showed me that Stanley Kubrick only a sister, no brother. However, one strange thing emerged from the interdweebs: Kubrick’s father was named Jacques Leonard Kubrick. He died in Los Angeles in 1985. Stanley also lived in Los Angeles for a brief period. One of his daughters (Vivian) was born here. Then I watched an absolutely fascinating documentary called Stanley Kubrick’s Boxes which detailed the incredible collection of stuff from Kubrick’s films still stored at his estate in London: mountains and mountains and mountains of cardboard boxes with every imaginable scrap of material from all his films. He never threw anything away, not one photograph or location report or planning session or cocktail napkin. The family and friends didn’t think these boxes should be thrown away so they donated them en masse to the University of the Arts London—an incredible film treasure. 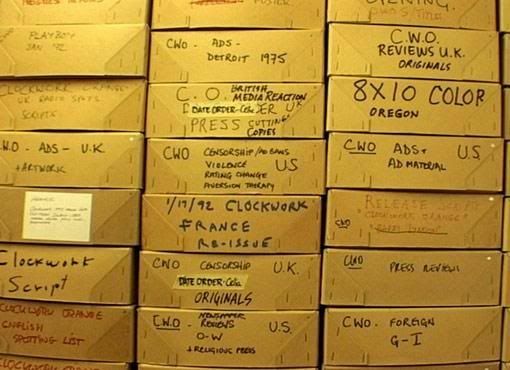 Before the archive went off to the U, though, filmmaker Jon Ronson was invited to the estate to go through those boxes and he made the documentary based on what he found, and on interviews with Kubrick’s family, friends, and co-workers. I highly recommend this film, not just for Kubrick fans or film buffs, but for anyone who wants a view inside the mind of creative genius. At one point, Ronson interviewed a gentlemen here in Los Angeles who had been responsible for collecting and reviewing, then storing all of the audition tapes for actors for Full Metal Jacket. Kubrick invited anyone who wanted to submit a tape to do so and there were hundreds and hundreds of them. Stored for years somewhere here in Los Angeles. Yeah, my imagination went there. But really, that’s all I have: imagination and admiration for Kubrick and a mysterious and cool cabinet with Kubrick scrawled across its bottom. For all I know, it could have belonged to Antonia Kubrick, beaded dressmaker; or Fernando Kubrick, herbalist; or Fitzhugh Kubrick, fancy pipe enthusiast. Imagination and speculative thinking, every bit of it. But that’s what I do. It’s a tenuous and threadbare connection to Stanley Kubrick, but it is the only definite one I have. 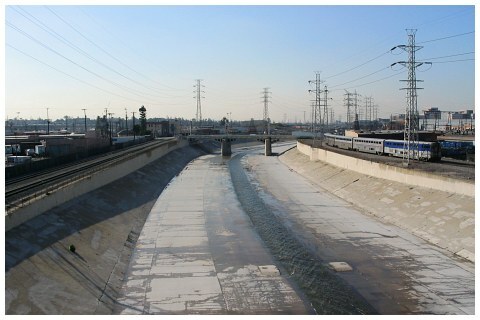 You are currently browsing the archives for the los angeles	category. WordPress 5.1.1 and delivered to you in 1.267 seconds using 31 queries.